The Swivel Sweeper Max is a lightweight, cordless sweeper that is built to swivel and pivot in any direction and pick up virtually anything from the floor. It will last 45 minutes on a single charge and contains removable bristles that can be freed of hair and other debris. The Swivel Sweeper Max also features quad brush technology, which refers to its ability to pick up and all four sides. Its corner brushes spin at 4,000 RPM's and can pick up along baseboards and in tight corners. The dirt tray is also touchless, allowing the user to empty it up crumbs with a simple press of a tab. The Swivel Sweeper Max is the lightweight, powerful, and cordless sweeper! It will pick up virtually anything and work on any floor surface, as well as get into places other sweepers and vacuums cant reach! The Swivel Sweeper Max is now equipped with 33% more power and features RCR technology that lets you remove the bristles and clean them out. And unlike ordinary vacuum cleaners, the Swivel Sweeper Max swivels and pivots in all directions, even in corners and along baseboards! Additionally, the Swivel Sweeper Max will get under furniture and up the stairs, which you will have no problem doing because its incredibly lightweight. The Swivel Sweeper Max features a touchless dirt tray and will even work for 45 minutes on one charge. And when youre done, its magnetic holder allows you to store it away anywhere! The cost of Swivel Sweeper is $19.99 plus $14.99 shipping. The special TV offer allows you to receive a second Swivel Sweeper by paying the extra shipping fee of $14.99 for a total price of $49.97. The Swivel Sweeper Max swivels and pivots in 360 degrees, allowing it to clean in all directions as well as under things and in corners. It contains quad brush technology, which means it will pick up debris and crumbs from all sides and along baseboards and tight corners. The Swivel Sweeper Max is also equipped with Removable Cleanable Reusable technology, which means that the bristles can be removed from the sweeper and manually cleaned of dust, hair, and more. How much does the Swivel Sweeper Max cost? 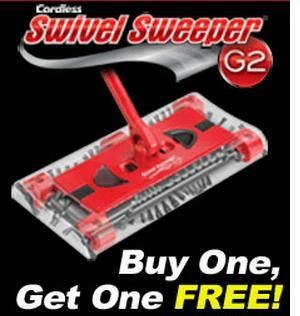 The Swivel Sweeper Max costs just 2 easy payments of $19.99 plus $14.99 shipping. How do I empty the touchless dirt tray? Simply press on the tabs located on the top of the sweeper and the dirt trap door will open. 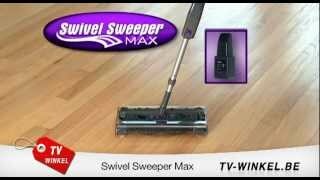 Can I find the Swivel Sweeper Max in stores? No, the Swivel Sweeper is not available in stores and can only be purchased online. Can I use the Swivel Sweeper Max on any type of flooring? Yes, the Swivel Sweeper Max will work on hardwood, carpet, tile, you name it. It is built to withstand all textures and pick up virtually anything. I Have waited 6 weeks for my swivel sweepers to arrive and they are still not here. I called customer service twice and they couldn't find my order so I emailed them using the email address they provided and they replied that they were unable to locate my order. They said call customer service. They also said they were having technical problems. I think this is all just a ploy to keep me from canceling my order which is what I want to do at this point. I can go to Bed, Bath and Beyond and pick one up any day of the week. I am a returning customer. I loved the first swivel sweepers I got several years ago but they are worn out now. I am not happy about all this. I loved my first swivel sweeper that I purchased several years ago; I was so happy I could order two and took one immediately to our Northwoods cabin. Unfortunately, both were popular with my family and used frequently - to the point the batteries were out of power and the charger didn't charge them anymore! I was so thrilled when I got a call about the Swivel Sweeper Max, so that we could have the ease of Swivel Sweeping again. Only one problem this time: I ordered two again, but was charged for 4; when I called to complain, I was told to "refuse shipment" when it arrived. Unfortunately, the delivery service left the box on the porch. It's now sitting inside waiting for a way to get back. Please send instructions to help me get it home: address, mail label, method of shipment, etal. Thanks! [for your great product, and for responding to my current need. ].